When circumstances necessitate bringing a caregiver into your home, it's easy to feel like you're being invaded. You're inundated with new things. New providers bring new people, new equipment, and new daily patterns. It can feel like your home is being overrun. 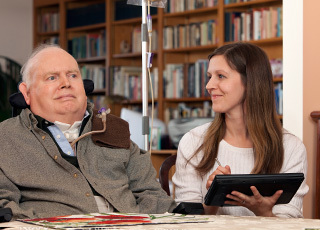 Our innovative approach to private duty nursing respects your home and our role in it. We provide expertise and support without meddling or trying to exert control over your home or your life. "I have been with Aurora for almost 25 years. When it became possible to take more control of my household, I did, and I love it. I am a very independent client so I love the freedom to find my own nurses, make my own schedule that works best for us and the nurses, and be able to keep the chart organized and up to date. Aurora provides a lot of freedom for the families to run the case the way we like it to be run. It's very rare that the nurses or I have to have help or intervention from the staff at the office. We pretty much handle everything on our own. The flexibility and freedom they offer is a big perk of not being under direct care of the traditional home care agencies." We have been providing excellent care for 29 years. We build long-term relationships with our patients. We have patients who have been with us for 25 years and nearly half our patients have been with us for more than a decade.